The story behind the Jesus Boulder is nothing but miraculous. 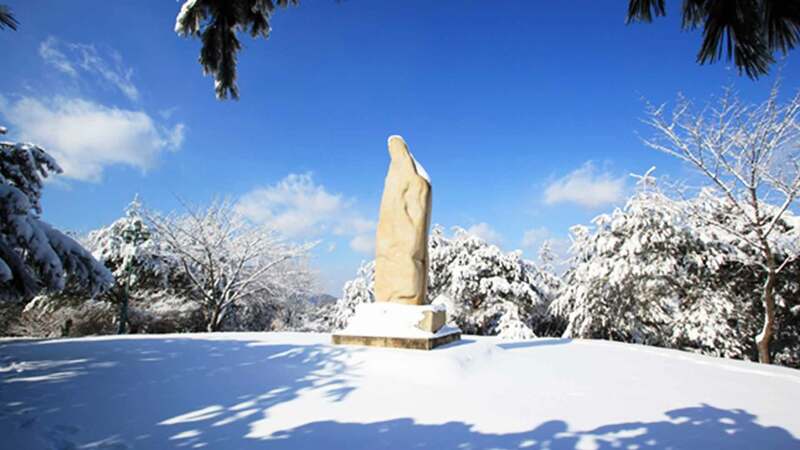 During the time when Pastor Jung was developing Wolmyeongdong, he spoke with an elder (Elder Kim) about his plans to erect a rock on the peak of the Front Mountain (also known as Faith Mountain). He asked the elder to “go and buy a fine looking rock,” but the elder said it would be difficult. Thousands of places sold rocks, and he had no idea what kind of rock to buy. He also didn’t want to go alone, but there was no other choice. That day, Pastor Jung had to stay behind to oversea the construction site and lead the workers. At a standstill, it was then that Pastor Jung received an inspiration from the Heavens. He told the elder, “Among all the rocks you find, buy the rock that looks abstractly like a person.” He also reminded the elder to speak to the owner wisely so that he could bu the rock at a cheap price. So the elder left early in the morning and returned at sunset. The rock that he brought did not have any special patterns and its size and beauty was nothing spectacular. It was an ambiguous rock, but because there were no other rocks and he had already purchased it, Pastor Jung put the rock at the peak of the Front Mountain. Different images appear when you look at the Jesus Boulder from slightly different angles. It is a stone made of granite. God was the one who brought it to Wolmyeongdong. It is a precious rock treasure whose quality cannot be matched. It is a granite rock that contains the Will of Heaven. At the peak of the Front Mountain, where the Jesus Boulder is, that particular spot in Wolmyeongdong is a place where each individual can pray to find a good place to build their life. The silhouette of the rock bears striking resemblance to Jesus, very nice!